A taxi waits for a ride in Central Tehran in front of a colourful mural. Buildings in Tehran are often covered in colourful, idyllic scenes that seem quite foreign to the crowded, polluted metropolis that is modern Tehran. Men skim through a pile of discarded books on the side of a road in central Tehran. Students finish an exam at the Iran-Canada Institute of Languages. Education is valued very highly in Iran and is seen as a 'way out'. Many of the younger students in this class are doing this English course outside of their normal schooling. Two young girls play hide and seek in the back streets of Kashan. It is around the age of puberty that girls start to wear the hijab properly, but many start younger to become accustomed to it. Two young men check their Facebook under graffiti in Western Tehran. Facebook is banned in Iran, but most young people freely access the site through the use of proxy defying software like Tor. Sara and Salman use Facebook to invite friends to their upcoming party. 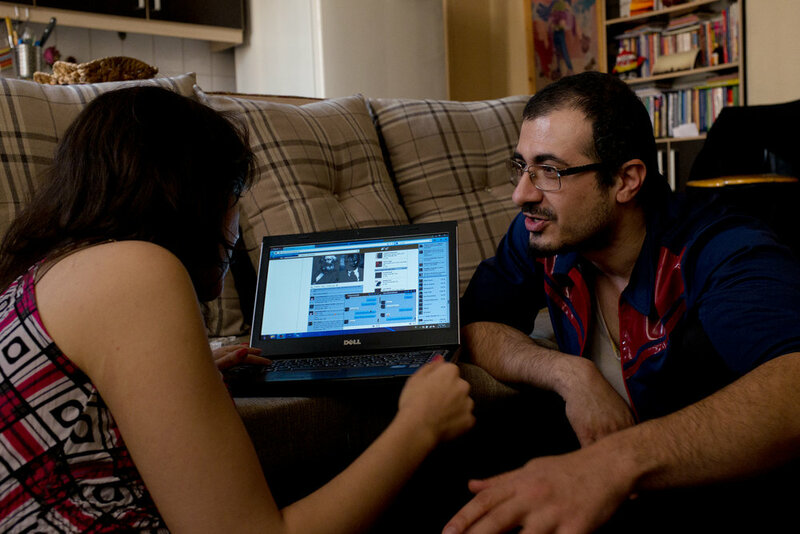 Facebook is banned in Iran, but most young people freely access the site through the use of proxy defying software like Tor. Men make their way around the gateway to Tehran, the Azadi Tower. Hossein Amanat, the architect of Azadi Tower, which translates to 'Freedom Tower', had to flee Iran eight years after the completion of his masterpiece because he was a member of the persecuted minority Baha'i. 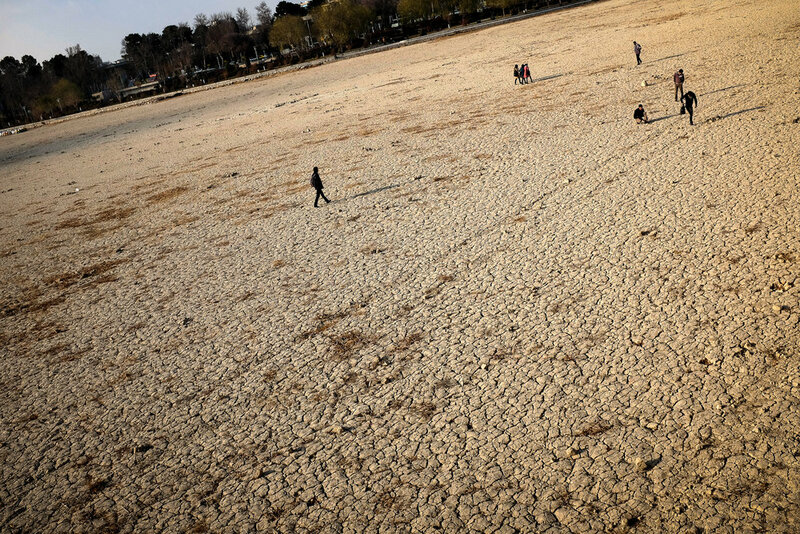 People make their way across the dry, cracked bed of the Zaindeh River in Esfahan. The Zaindeh was once one of the grandest rivers in all of Iran, but has long dried up because of drought and poor water management. Zaindeh, which means ‘life-giver’, literally gave life to the region for thousands of years, but now with no water, it serves more of a visceral reminder of the region’s troubles. Shadows fall on the ancient dry clay walls of Kashan. A woman walks down an empty street in Tehran. Two women walk past a store selling cloth in Kashan. 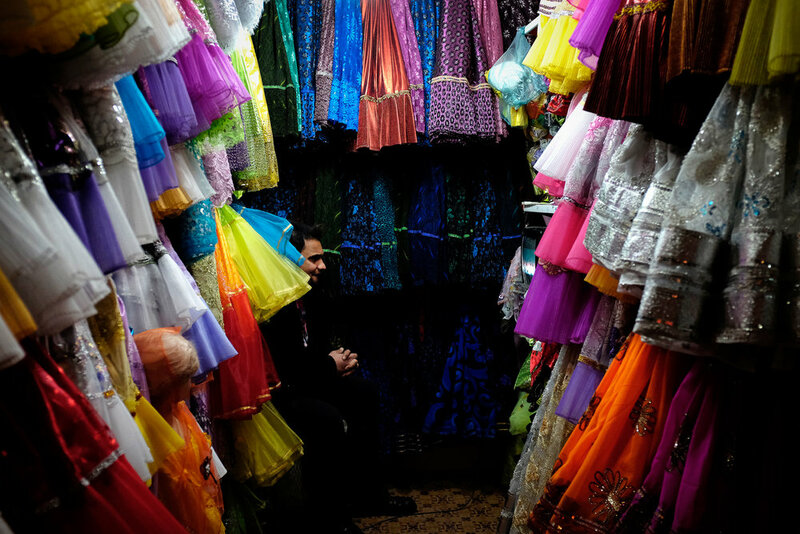 A shopkeeper straightens some wedding dresses in Kashan. 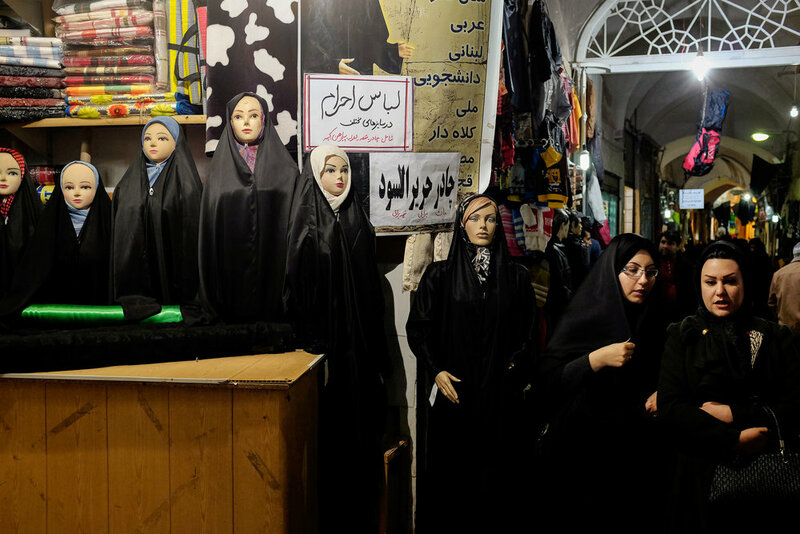 Despite women being very restricted in how they can dress in public in a traditional city like Kashan, the full array of fashion – from iconic western brands (usually fake) to your more traditional Persian garments – can be found most large bazaars. Women make their way toward mosque at prayer time in Kashan. A print of a woman is covered by a headscarf in a bazaar in Central Tehran. Men gather for prayer in Kashan. 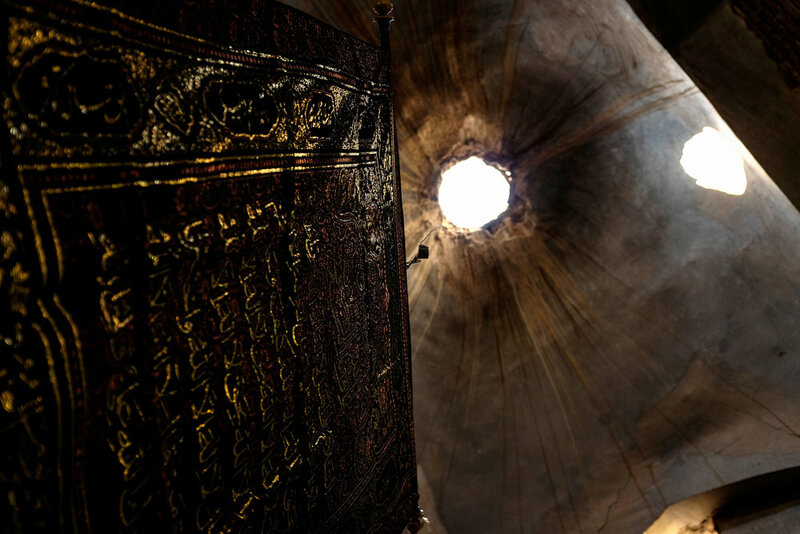 A man prays towards the setting sun in a mosque in Shiraz. Prayer flags hang in a bazaar in Esfahan. 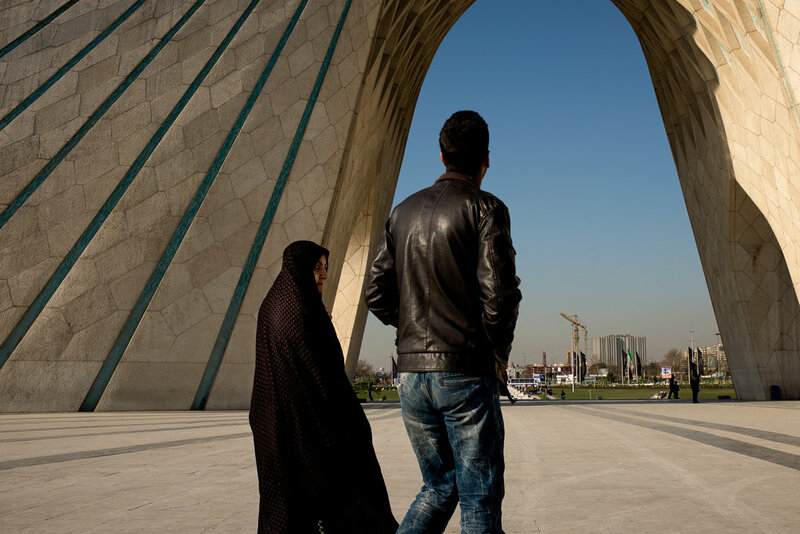 A woman casts her eye sideways as she walks underneath the Azadi Tower in Tehran. A wife walks behind her husband in Kashan. An elderly man clings to his bread in the back alleys of Shiraz. Two men buying and selling drugs in Shiraz. Despite drugs being outlawed in Iran, there is a growing population of drug addicts. Heroin is of particular concern in Iran, easily flowing in over the border with Afghanistan, but crystal meth is fast growing in use. 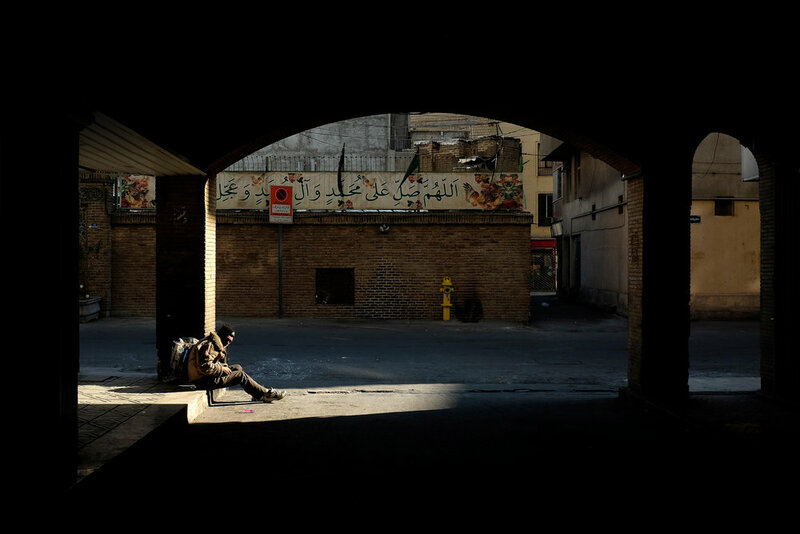 An addict is illuminated by the sun under a bridge in Central Tehran. A man watches a local football game in his fabric store in Esfahan. 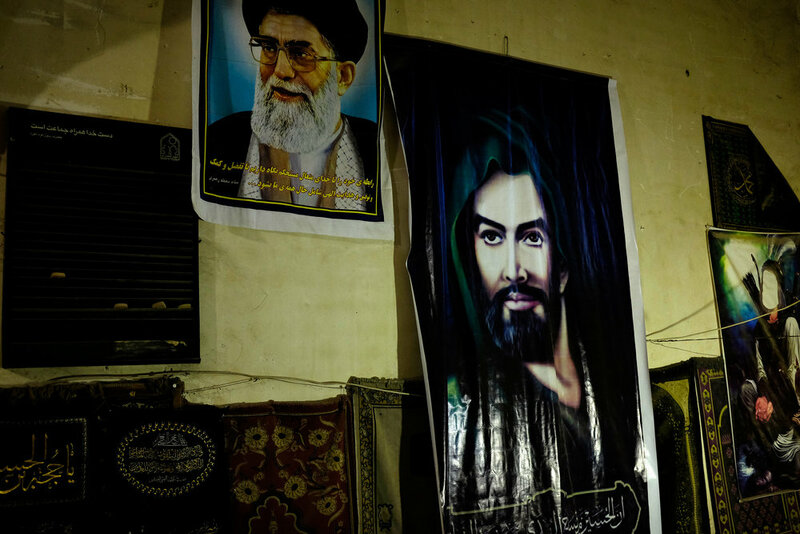 The Supreme Leader, Ayatollah Khamenei is depicted next to the Prophet Ali in a bazaar in Shiraz. A mechanic tinkers late into the night inside an old Saipa in Tehran. It can be incredibly difficult to find work in Iran, and when employment is found the wages are very low, so people work long hours to make as much money as they can. Qalyan (flavoured tobacco) has officially been banned in the Esfahan provence, but there are many teahouses that still sell the flavoured tobacco quite freely. These teahouses serve as a common place for men to gather and relax together. Three men wait for a bus in Tehran. Public buses are still segregated between men and women in Tehran. Children on an excursion run underneath the Azadi Tower in Tehran. A site of irrefutable international significance; older than Christ, built by Darius and Xerxes, destroyed by Alexander. If this was in almost any other country in the world, it would have thousands walking through these pillars every day. But today, the ancient city of Persepolis lies almost empty of tourists. A palace empty of people on a perfect day in Kashan. While tourism in Iran is slowly growing, the government needs to take some giant leaps towards actively attracting people to visit the country if they want the industry to flourish.